A recent market study published by PMR – “Metagenomics Market: Global Industry Analysis 2013-2017 & Forecast 2018-2028” consists a comprehensive assessment of the most important market dynamics. On conducting a thorough research on the historic as well as current growth parameters of the Metagenomics market, growth prospects of the market are obtained with maximum precision. The report features unique and salient factors that may make a huge impact on the development of the Metagenomics market during the forecast period. It can help market players to modify their manufacturing and marketing strategies to envisage maximum growth in the Metagenomics market in the upcoming years. The report provides detailed information about the current and future growth prospects of the Metagenomics market in the most comprehensive way for the better understanding of readers. The report commences with the executive summary of the Metagenomics market report, which includes the summary of key findings and key statistics of the market. It also includes the market value (US$ million) estimates of the leading segments of the Metagenomics market. Readers can find detailed taxonomy and the definition of the Metagenomics market in this chapter, which helps readers to understand the basic information about the Metagenomics market dynamics, supply chain, cost structure, pricing analysis, list of key distributor and suppliers, list of key market participants included in the report. 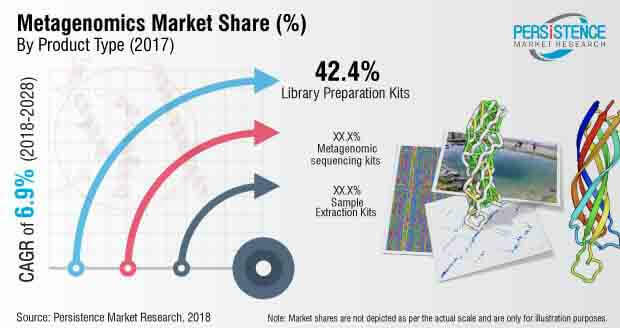 Based on the product type, the Metagenomics market is segmented into Library preparation kits, Sample extraction kits and metagenomics sequencing kits. In this chapter, readers can find information about key trends and developments in the Metagenomics market and market attractive analysis based on the product type and various kits used for sequencing . In this chapter, readers can find information about key trends and developments in the Metagenomics market and market attractive analysis based on the product type for each region. Based on the Application Type, the Metagenomics market is segmented into microbial diversity, Bioremediation, Biosurfactants and antibiotic production, clinical diagnostics and others. In this chapter, readers can find information about key trends and developments in the Metagenomics market and market attractive analysis based on Application Type. In this chapter, readers can find information about key trends and developments in the Metagenomics market and market attractive analysis based on the Application Type for each region. Based on the End User, the Metagenomics market is segmented into Pharmaceutical industries, diagnostic laboratories, hospitals, academic research institutes and other end users. In this chapter, readers can find information about key trends and developments in the Metagenomics market and market attractive analysis based on End User. In this chapter, readers can find information about key trends and developments in the Metagenomics market and market attractive analysis based on the End User for each region. This chapter explains how the Metagenomics market will grow across various geographic regions, such as North America, Latin America, Europe, Asia-Pacific Excluding Japan (APEJ), Japan and the Middle East & Africa (MEA). This chapter includes detailed analysis of the growth of the North America Metagenomics market along with the country-wise assessment including the U.S. and Canada. Readers can also find regional trends, regulations, and market growth based on product type, application type, end users and country of Metagenomics in the North American region. Readers can find detailed information about factors such as regional trends that are impacting the growth of the Latin America Metagenomics market. This chapter also includes the growth prospects of the Metagenomics market in leading LATAM countries such as Brazil, Mexico, Argentina, and rest of the Latin America region. Important growth prospects of the Metagenomics market based on its product types, form, and applications in several European countries, such as EU4, UK, BENELUX, Nordic, and Eastern Europe is included in this chapter. Important growth prospects of the Metagenomics market based on its product types, form, and applications in CIS & Russia, such as EU4, UK, BENELUX, is included in this chapter. Readers can find important factors that can make a huge impact on the growth of the Metagenomics market in Japan based on the market segmentation, during the forecast period. This chapter provides the overview of regulations, drivers, restraints, and trends in the Japan Metagenomics market. Great China, India, ASEAN, Australia and New Zealand are the leading countries in the APEJ region that are the prime subject of assessment to obtain growth prospects of the APEJ Metagenomics market in this chapter. Readers can find thorough information about the growth parameters of the APEJ Metagenomics market during the period 2016-2028. This chapter provides information on how the Metagenomics market will grow in the major countries in MEA region, such as GCC Countries, Turkey, Iran, Israel, and South Africa, during the period 2013-2028. In this chapter, readers can find a comprehensive list of all the leading stakeholders in the Metagenomics market along with detailed information about each company, including company overview, revenue shares, strategic overview, and recent company developments. Market players featured in the report include Illumina Inc, Thermo Fisher Scientific, Trivitron Healthcare, Qiagen, Symbio Scientific Pvt Ltd., Infobio, Bio-Rad laboratories, Merck KgaA, Promega Corporation, Perkin Elmer Inc. This chapter helps readers to understand the research methodology followed to obtain various conclusions, important qualitative information, and quantitative information about the Metagenomics market. The metagenomics market is dominated by the leading players, for example, GE Healthcare, Thermo Fischer Scientific, Inc., Danaher and Merck KGaA. These companies are focusing on to launch new products in the metagenomics market. The companies operating in the metagenomics market are focusing on mergers and acquisitions to expand their portfolio. To expand in the metagenomics market, the companies are working together. In this market, the companies are focusing on to expand their distribution channels in the emerging countries. Apart from this, many companies are planning to invest in new facilities to increase the production capacity. There is an increase in the awareness regarding genetic disorders, which is expected to boost the growth of the metagenomics market. Clinical diagnostics is the most important application area, where metagenomics plays an important role. For example, in India, the occurrence of genetic disorders has increased. The American region is expected to hold large share of the global metagenomics sequencing market owing to the rising genetic abnormalities and diseases, governmental support for the research and development in genetics, and presence of sophisticated infrastructure. With technological advancements, many new bioinformatics tools have been introduced in the metagenomics market, which increase the revenue in the metagenomics market. The improved genomic tools and advanced technological platforms are the key factors driving the growth of the global metagenomic market. With the development of new research laboratories, there is an increase in research and developmental activities which is driving the metagenomics market Introduction of microarray which is the fast-growing segment in diagnostics has led to an increase in the revenue share of the metagenomics market. The evolution of microarrays by different companies manufacturing metagenomics products have increased the diagnosis rate of genetic disorders. Factors such as use of advanced bioinformatics tools, high throughput screening methods and development of cost-effective methods are expected to drive the growth of the metagenomics market. Metagenomics plays an important role in bioremediation as microorganisms are the main agents of bioremediation. Microorganisms are responsible for degradation of environmental pollutants. The metagenome of a contaminated environment includes all the DNA involved in that environment. Genetic information is used to understand how contaminants and treatments are affecting the complex microbial communities that exist in the environment. Apart from environmental toxicology, development of new research laboratories is playing an important role in the growth of the metagenomics market. With technological advancements, many new bioinformatics tools have been introduced in the market, which is expected to contribute to the growth of the metagenomics market. Besides, advanced technological platforms and improved genomic tools are the key factors expected to drive the growth of the global metagenomics market. The companies are focusing on to develop new types of sequencing products that aim at increasing the product portfolio and revenue of the metagenomics market. New sequencing techniques have been introduced which are expected to increase the revenue of metagenomics market. Advancement in bioinformatics programming has enabled researchers to conduct 3D metagenomics experiments with the help of new bioinformatic tools. For instance, in February 2017, a team of researchers at the Institute Pasteur conducted an experiment using 3D structures of DNA fragments collected from microbiota of mouse intestine to analyze interactions between phage and bacteria. Introduction of various new genome projects allow the researchers to make a new database for various research and developmental activities. Development of other genomic programs are also expected to increase the revenue of the metagenomics market. Many western countries are developing their own programs in the metagenomics market. For example, Australia is currently working on a four year 100000 genome project, which will sequence the patients with rare diseases and cancer. The competition section of the report features profiles of the key players operating in the market based on their market shares, differential strategies, product offerings, marketing approach and company dashboard. Examples of some of the key players featured in this report include Illumina Inc, Thermo Fisher Scientific, Trivitron Healthcare, Qiagen, Symbio Scientific Pvt Ltd., Infobio, Bio-Rad laboratories, Merck KgaA, Promega Corporation, and Perkin Elmer Inc.
Thermo Fisher Scientific and Qiagen offer a range of products for metagenomics, which include various DNA extraction kits and others. Merck KgaA is involved in manufacturing of DNA polymerases, which play a major role in DNA fragments sequencing. The key manufacturers of metagenomics are focusing on developing new sequencing kits. The companies are focusing on to expand their presence in the emerging markets such as South America and Eastern Europe. They are mainly involved in mergers to grow in the metagenomics market. For example, in 2017, Qiagen and NeuMoDx announced strategic partnership to offer next generation systems for fully integrated diagnostic testing. Metagenomics is a new high throughput screening tool for the microbial community. It basically refers to the study of genetic material recovered from the microbial community present in the environmental sample. The primary aim of conducting a metagenomics experiment is the analysis of genes and the study of metabolic pathways. Metagenomics is used to explore new pharmaceutical and industrial products from the environment. It deals with the study of composition and taxonomy of microbial culture. The metagenomics market deals with three kind of products – library preparation kits, sample extraction kits and metagenomic sequencing kits. The total genome is isolated from the environment, fragmented and then sequenced. FMI conducted a research study on metagenomics market for the forecast period 2018 to 2028. The metagenomics market report offers a comprehensive evaluation of the business opportunities prevailing in the metagenomics market along with insights on the metagenomics current trend, disease incidences, and awareness level for genetic disorders and market competition. The report elaborates the macroeconomic factors influencing the dynamics of metagenomics market and its futuristic potential. The report offers a comprehensive taxonomy of metagenomics market based on product type, applications, end users and region. There are three types of kits which are majorly used in the metagenomics market. These kits are library preparation kits, sample extraction kits and metagenomics sequencing kits. The library preparation kits involve the preparation of nucleic acids targets using a series of enzymatic reactions. The sample extraction kits are used to isolate the genomic DNA from a wide range of samples such as cells and tissues. Metagenomic sequencing kits are used to sequence the DNA fragments. There are various applications of metagenomics including microbial diversity, bioremediation, bio surfactants and antibiotics production, clinical diagnostics. Clinical diagnostics is expected to hold large share in the metagenomics market. End-use segments in metagenomics market include pharmaceutical industries, hospitals, academic and research institutes, research laboratories and others, such as clinics, emergency services. The metagenomics market has been analysed across regions, namely North America, Latin America, Europe, Asia Pacific Excluding Japan, Japan and MEA. What is the revenue potential of the metagenomics market across regions of North America and Europe? Who are the key competitors and what are their portfolios in metagenomics market? What are major challenges influencing the growth of the metagenomics market? How intervention from regulatory authority is shaping the growth of the metagenomics market? The metagenomics market has been estimated based on supply-demand approach. A triangulation methodology is adopted to derive the market size, which is primarily based on overall expenditure on life science research funding and capital equipment installed base to obtain precise market estimations and insights on life science and biotechnology associated products, applications, technologies and services. Bottom-up approach is always used to obtain insightful data for the specific country/regions. The country-specific data is again analysed to derive data at a global level. This methodology ensures accuracy and high quality of information. This information is further validated with rigorous primary research (including interviews, , in-person interactions, surveys and viewpoints of seasoned analysts) and secondary research (including verified paid sources, authentic trade journals, and resourceful databases). With this approach, the report on metagenomics market projects the industry attractiveness of every major segment over the forecast period.